The artistic creativity some people possess never ceases to amaze me. 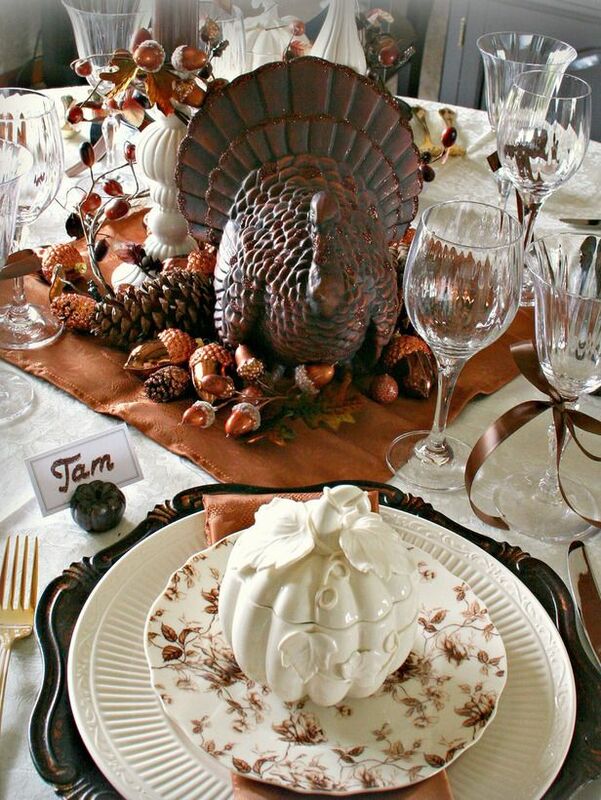 When it comes time for me to choose Thanksgiving centerpieces and place settings for my own table, I never lack for inspiring ideas from others. Thanksgiving place settings and centerpieces can be simple or extravagant, but no matter your ambition or budget, there are always ways to present a beautiful table that shows your guests how much you care. A simple sprig of rosemary tied into a wreath makes a lovely, and fragrant, place card. 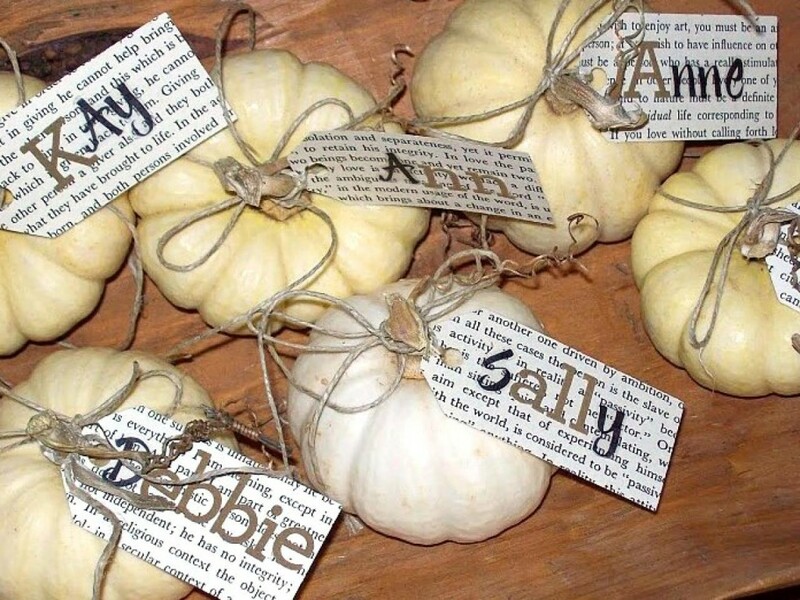 Using mini pumpkins as place cards is easy and adorable. Find some fun scrapbook paper for the names and attach to the stems with some twine. 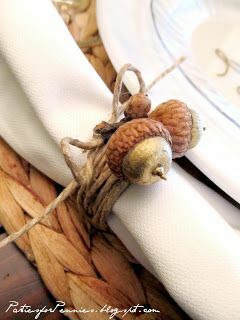 Twine and acorns can make a charming and organic napkin ring. Owls are everywhere these days and I happen to love them. 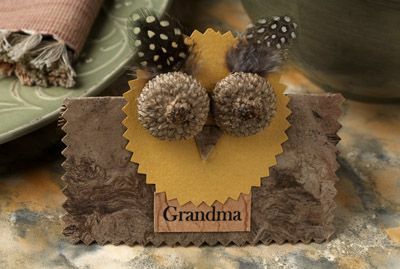 These owl place cards are adorable and will be a huge hit for your guests, both young and not-so-young. 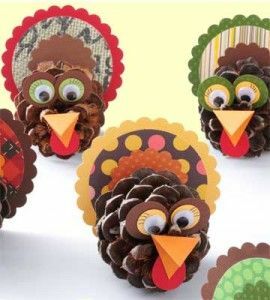 These pine cone turkey place cards are precious. 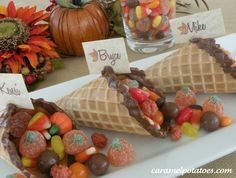 The kids at your gathering will think they’re awesome! This is an extremely creative idea. Simply buy some butcher block paper or even scrapbook paper and cut as a placemat. 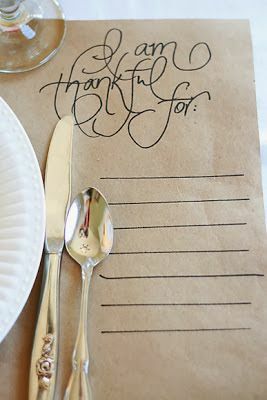 Then hand write the wording, draw some lines and you have the perfect way for everyone to share all their blessings. What could be better than an edible place card? 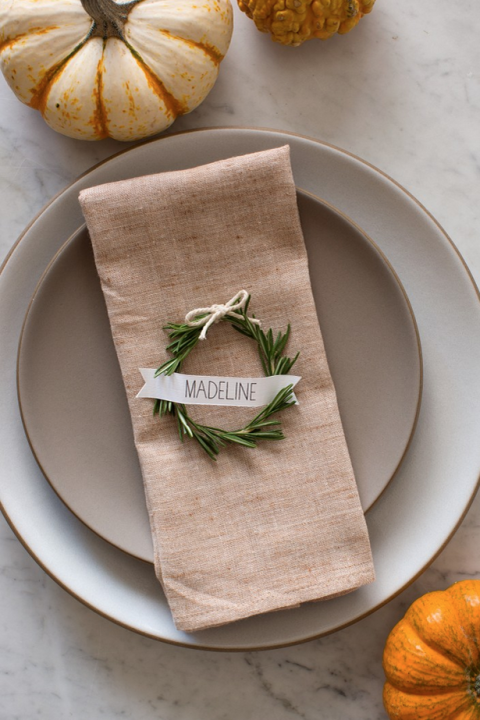 This clever idea is the perfect touch to your table. 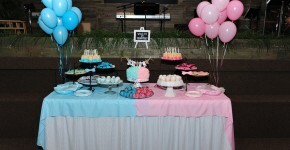 I especially love this gorgeous centerpiece. 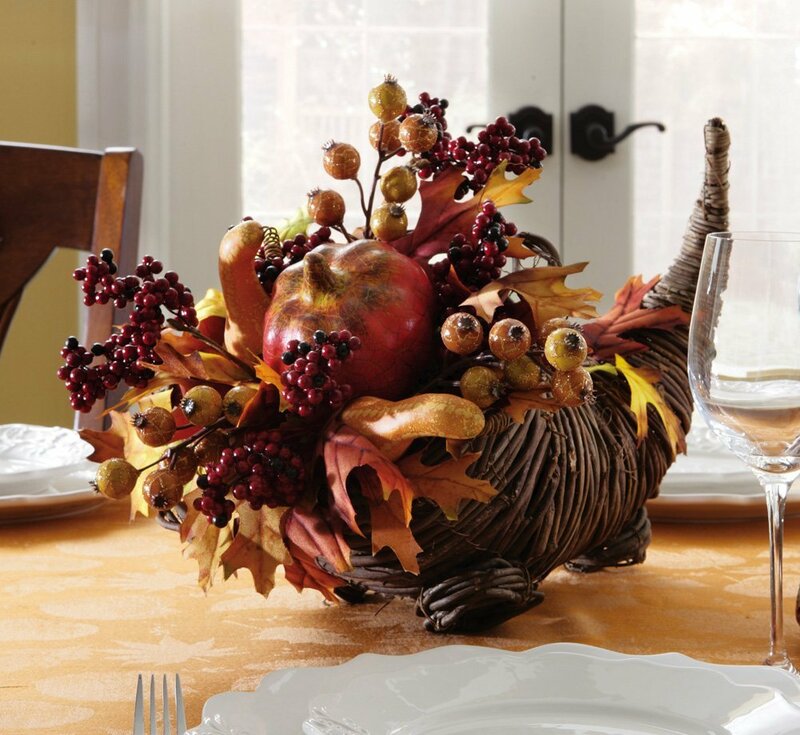 Of course, not everyone has a huge ceramic turkey – but, if you do, putting it in the middle of your Thanksgiving table will definitely do it justice! I absolutely love the look of this centerpiece. 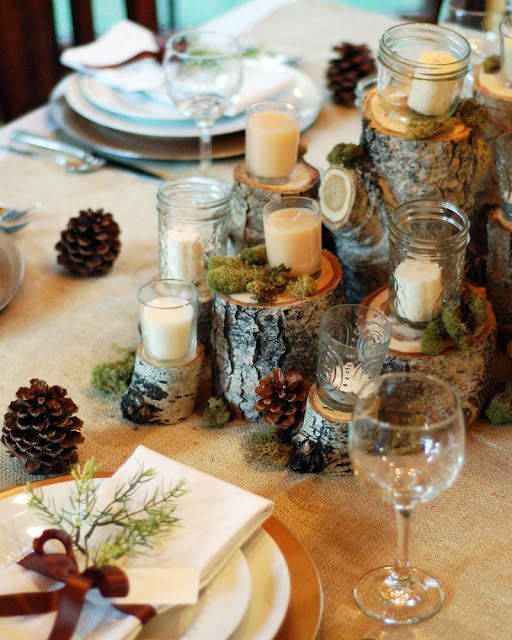 The wood stumps at varying heights, embellished with pine cones, moss and candles is exactly the kind of woodsy, natural look I love. And I especially love a centerpiece where you can find many of the elements in your own backyard! I’m a big fan of decorative gourds mixed with pumpkins. This wood box is filled with them and it’s stunning. 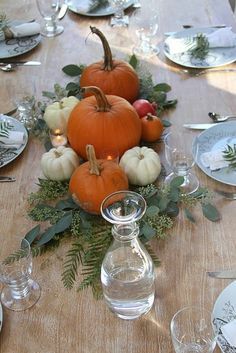 Once again, you can’t go wrong with pumpkins, gourds and assorted greenery on your Thanksgiving table. This particular arrangement is simple yet festive. This is one of my favorites. Thankfully, I have a husband who has a wide array of tools and is handy with wood. So, when I asked him if he could recreate this pretty candleholder, he accepted the challenge! 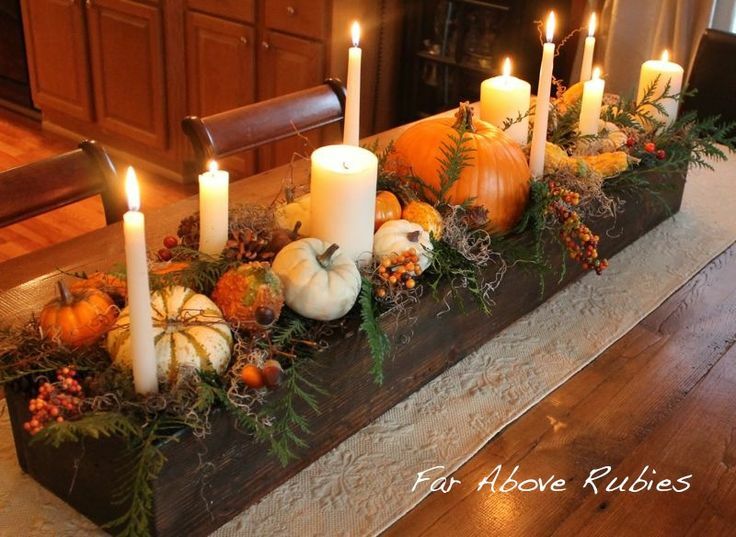 It’s pretty all on its own, but add an assortment of pumpkins, gourds and fall leaves, and it’s spectacular! 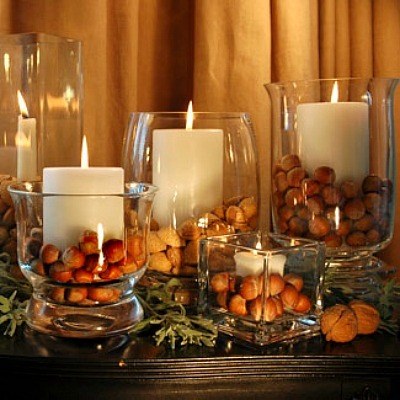 Glass containers of different sizes filled with assorted nuts such as chestnuts, walnuts and almonds make a beautiful addition to the table. 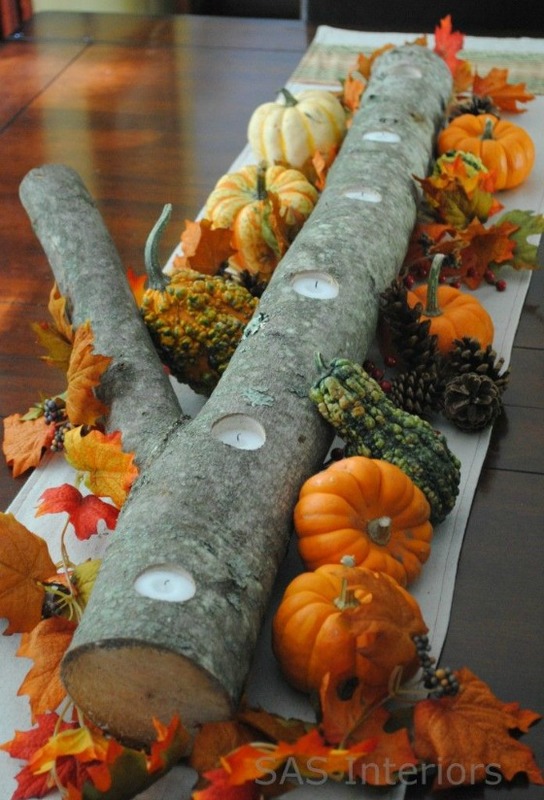 This centerpiece is striking yet very simple to create. The cornucopia is the traditional decoration for Thanksgiving as it symbolizes abundance and nourishment. It also makes the perfect centerpiece for your table. THE WOODED GLEN WISHES YOU A HAPPY THANKSGIVING! !